The Department’s physicians are experienced in the medical management of allergy and inflammatory conditions that affect the nose and paranasal sinuses in adults and children. 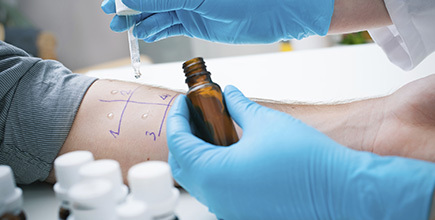 They are also experienced in immunotherapy for allergic diseases and counseling patients in environmental avoidance therapy and techniques. An allergy is an abnormal reaction to an ordinary harmless substance called an allergen. When the allergen is absorbed into the body of an allergic person, symptoms such as a runny nose, watery eyes and itching and sneezing develop. People can be allergic to one to several allergens. The most common are pollens, molds, dust mites, animal dander, foods, medications, cockroach droppings and insect stings. Recent studies have shown ten percent of people who suffer from chronic ear infections develop allergies. In the United States, allergies affect 1 out of 6 people.